The Alfa Romeo Stelvio Quadrifoglio, the first Quadrifoglio SUV, is set to become the new benchmark in the premium compact SUV segment. 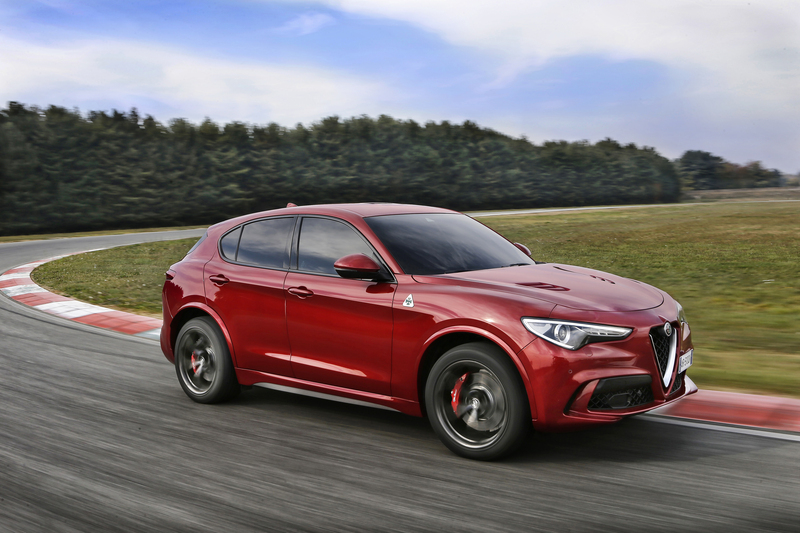 With its awe-inspiring design, performance and technology, the Stelvio Quadrifoglio is the "fastest SUV around the circuit", having clocked the new record for its class on the iconic Nürburgring: 7 minutes 51.7 seconds. The Stelvio Quadrifoglio is equipped with the exclusive aluminium 2.9-litre V6 Bi-Turbo petrol engine, developed with inputs and engineering know-how from Ferrari technologies. It delivers maximum power of 510hp at 6,500rpm and generates a maximum torque of 600Nm from 2,500 to 5,000rpm and is teamed with the specifically calibrated eight-speed automatic transmission, that shifts gear in just 150milliseconds in Race mode. The Stelvio Quadrifoglio can accelerate from zero to 62mph in just 3.8 seconds, and on to a best-in-class top speed of 176mph. The Alfa Romeo Stelvio Quadrifoglio is also incredibly efficient in terms of emissions and fuel consumption, thanks to its electronically controlled cylinder deactivation system and the "sailing" function, available in Advanced Efficiency mode. To maximise the driving experience, Stelvio Quadrifoglio is also equipped as standard with one-piece aluminium paddle shifters, integrated into the steering column. For the first time, the 510hp 2.9 V6 Bi-Turbo petrol engine is combined with the innovative Q4 all-wheel drive system, which offers a potent combination of unbeatable performance, traction, driving pleasure and safety in all situations. In normal conditions, the Q4 system transfers 100 percent of the torque to the rear axle. As the wheels approach their grip limit, the system transmits up to 50 percent of the torque to the front axle in real time, by means of a transfer case. The Alfa Romeo Stelvio Quadrifoglio is equipped with the exclusive AlfaTM Chassis Domain Control (CDC) unit, with differential AlfaTM Active Torque Vectoring as standard. CDC acts as the brain of the Stelvio Quadrifoglio, and coordinates all the car's electronic systems, to deliver the best performance and the utmost driving pleasure at all times. The system simultaneously assigns specific tasks to the various active systems, such as the AlfaTM DNA Pro selector, Q4 all-wheel drive, AlfaTM Active Torque Vectoring system, AlfaTM Active Suspension system and the ESC. The Torque Vectoring technology optimises the Stelvio Quadrifoglio's drive distribution and accentuates its sporting character. The two electronically controlled clutches in the rear differential make it possible to control torque delivery to each wheel separately. This ensures the optimal transfer of power to the ground even when the car is pushed to its dynamic limits, without the need for intrusive inputs from the stability control system. The Stelvio Quadrifoglio holds two best-in-class titles which make it the highest-performing SUV in its segment: with a kerb weight of 1,830kg, the model boasts the best power to weight ratio in its category at 3.6 hp/kg and the best power density at 176 hp/l. The power-to-weight ratio was delivered with the aid of ultra-lightweight materials such as carbon fibre for the driveshaft and aluminium for the engine, suspensions, brakes, doors, wheel-arches and bonnet. Due to the perfect weight distribution between the two axles, achieved by tweaking the SUV's layout and arranging the heavier elements in the most central position possible, the Quadrifoglio’s light weight does not adversely affect the car’s torsional rigidity. It remains durable, with low noise levels and exceptional handling, even under extreme stresses. Up front, the Stelvio Quadrifoglio has a double wishbone system with semi-virtual steering axis, to optimise bump filtration and ensure quick, precise responses to steering inputs. By keeping the contact patch of the tyre constant when cornering, this exclusive Alfa Romeo set-up affords outstanding levels of lateral grip. But regardless of speed and conditions, the Alfa Romeo Stelvio Quadrifoglio always delivers a natural, instinctive drive. The rear suspension uses a four-and-a-half link Multilink system – patented by Alfa Romeo – to deliver a winning combination of performance, driving pleasure and comfort. An electronically controlled damping system adapts to driving conditions instantly and enables drivers to opt for performance-biased or comfort-oriented handling. Alfa Active Suspension controls the suspensions and shock absorbers continuously to reduce movement of the body of the car in all driving conditions. It constantly interacts with the CDC and Alfa DNA Pro and calibrates its actions to suit the driving mode selected, delivering unrivalled comfort and handling. In any situation and at all speeds, driving the Alfa Romeo Stelvio Quadrifoglio has the most direct steering ratio on the market (12.1), with a natural and instinctive feel. Having made its debut on the Giulia, Alfa Romeo's unique Integrated Brake System (IBS) is now in use on the Stelvio Quadrifoglio. This innovative electromechanical system combines stability control with a traditional servo brake to deliver instantaneous brake response and shorter stopping distances, while also making a significant contribution to weight optimisation. The Stelvio Quadrifoglio will optionally be available with carbon ceramic brake discs, offering a weight reduction of 17kg and greater mechanical strength, even at the highest temperatures in both dry and wet conditions. The design of the Alfa Romeo Stelvio Quadrifoglio is inspired by the idea of “necessary beauty”, as the perfect synergy of form and function is even more extreme in this high-performance SUV. Style and design are not merely aesthetic considerations but also support crucial factors including aerodynamics, speed, power and handling. Mirroring the performance, in Quadrifoglio guise everything is raised to new heights and has an even greater visual impact. The finest expression of Italian design, the interior of the Stelvio Quadrifoglio has been tailored like a bespoke suit with painstaking craftsmanship and use of premium materials, including carbon fibre, leather and Alcantara. The centre of the dashboard is dominated by the new 8.8-inch AlfaTM Connect infotainment system - with 3D navigation. It incorporates Apple CarPlay and Android AutoTM to replicate the smartphone environment on the on-board display, for constantly connected, safe, user-friendly life at the wheel. The Stelvio Quadrifoglio will arrive in the UK in summer 2018, with pricing and specification to be confirmed nearer the time. To find out more about the Alfa Romeo range, visit www.alfaromeo.co.uk or to locate your nearest Alfa Romeo dealer visit www.alfaromeo.co.uk/find-a-dealer.